Reid’s goal – A corner is headed towards goal by Reid and, whilst it is is inadvertently blocked on the line by Nolan, it falls kindly to Reid who finishes at the second attempt. As we set up to defend the corner, Vertonghen is marking Reid, and Nolan is making a nuisance of himself on the line. Vertonghen gets up very early – almost too early. Nolan comes away from Dembele on the line. Vertonghen is caught under the ball and, when he misses it, he leaves Reid in space to head down towards the far corner. Fortunately, Nolan has moved this way, and inadvertently blocks the header. *Unfortunately*, it comes straight back out to Reid, who does well to adjust his body and is in enough space to fire home. It’s beyond Lloris before he can move. Could he have come to punch the corner? Possibly, but Nolan’s position is an intelligent one, as it makes him think twice. Yet another example of Spurs failing to defend a set piece properly. Very poor from Vertonghen, but Nolan shouldn’t have been allowed so much room in the 6-yard box either and, had he turned the ball in, there would have been just as many questions. Vaz Te’s goal – Townsend loses the ball in midfield and Noble feeds Vaz Te, who gets a little lucky and beats Lloris at the second attempt. 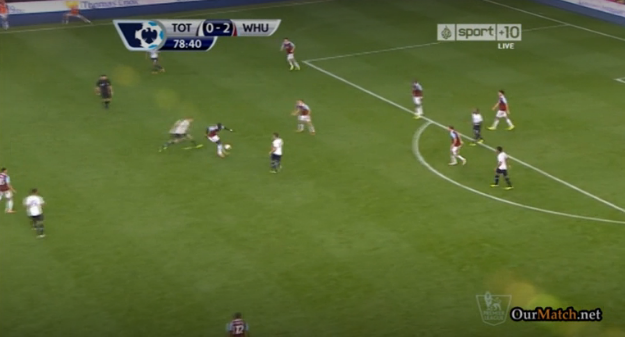 Andros Townsend gives the ball away somewhat cheaply – Noble intercepts and wriggles away from Dembele. With Walker having been up-field, overlapping Townsend, Noble is alert enough to quickly feed a pass into the channel for Vaz Te to run onto. Dawson is quite deep but – regardless – with no pressure on the ball, we cannot be trying to play offside here. Walker gets back at Vaz Te, but not quickly enough to stop him getting his shot away. Lloris had done well to narrow the angle, and makes a save with his legs. Unfortunately for the goalkeeper, the ball ricochets back off Vaz Te’s knee and squirms beyond him. 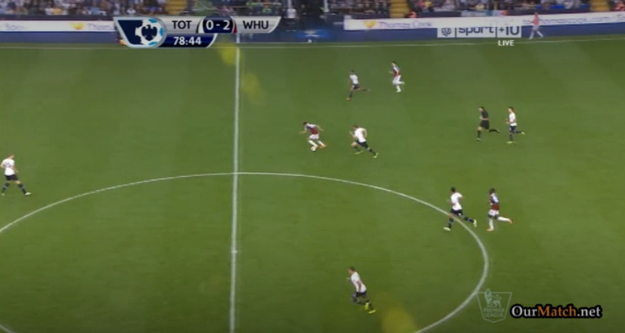 This was a clear example of West Ham’s numerical advantage in midfield having an effect. 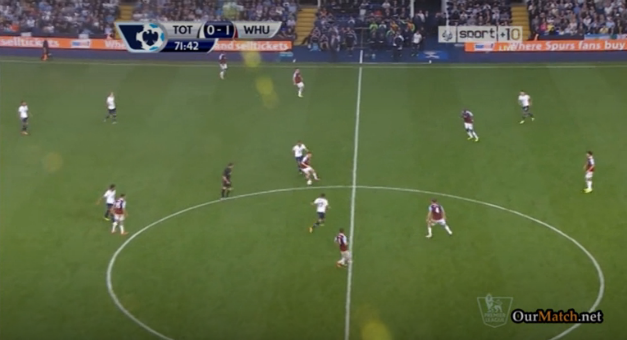 Firstly, Townsend is crowded out, and then we didn’t have enough bodies to press the ball, as Paulinho was occupied, and Dembele had already committed himself. 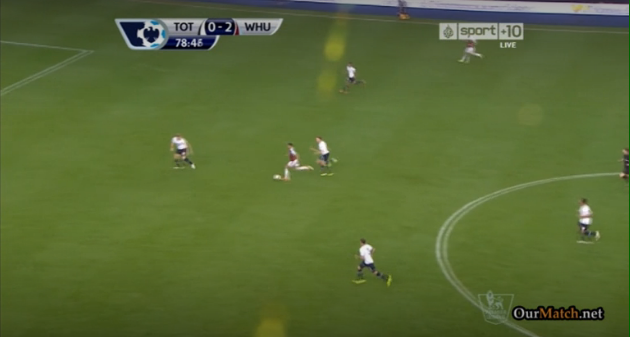 Walker had overlapped Townsend – totally understandable at 1-0 down, at home, and looking for a goal – but the lack of cover in that area meant that we were punished. Morrison’s goal – A clearance is brought down brilliantly by Diame, who evades Vertonghen, and nicks the ball beyond Dembele to Morrison. He runs from inside his own half, beats Dawson, and lifts the ball over Lloris. Diame brings a high ball down beautifully, and turns away from Vertonghen, who has committed himself very high up the pitch. Dembele seems to spot the danger, but rather than jockeying Diame and staying with his man, Morrison, he too wants to take the ball. Diame draws Dembele in and finds Morrison, who now has a clear run at Dawson. With Vertonghen chasing back, Morrison gets the ball under control and starts a powerful run. Dembele is jogging back, and Walker/Naughton are attempting to get back to effect play as well. Dawson does everything right up until this point, as Vertonghen shows signs of being able to get back. But rather than jockeying further, Dawson commits, trying to nick the ball. Morrison runs through to chip the ball over Lloris. It’s easy to point the finger at Dawson but, for me, he was in a difficult situation – he risked giving away a foul (and therefore getting a red card) – so was trying to nick the ball without taking the man. Poor decision-making from Vertonghen and Dembele put him in this position, and Dembele’s jog back home after being beaten with ease was very frustrating, even at 3-0. A bad day at the office from Spurs in virtually every way. Toothless up front, with Defoe only touching the ball 22 times, but also overrun in midfield, too slow in moving the ball, and totally unsure of our usual pressing game due to West Ham’s numerical advantage in that central area. This was most certainly a game for Sandro, and it’s surely now only a matter of time before he’s one of the first names on the team sheet again. Totally agree with the summary. I like the fact that AVB rewards players in form but I wonder if he is a bit guilty of trying to appease the squad a bit too much like he did with Brad/Lloris? We are one of the few teams at the moment that appear to have a stronger bench. Possibly right actually - and another question raised is that if Defoe was being rewarded for good form, why wasn't Holtby? Hey Windy, great analysis as usual. Completely agree. 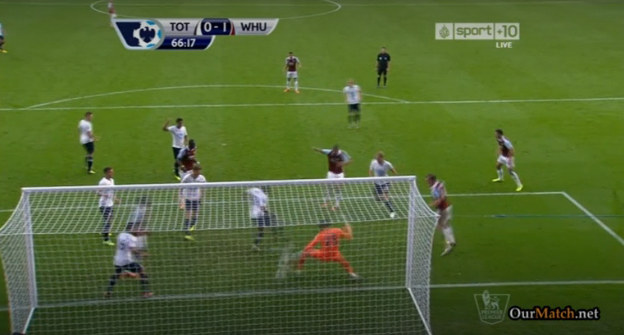 Also, with the final goal, its a total misunderstanding between Verts and Daws. Daws is showing Morrison to his right, *assuming* that Vertonghen is coming back to cover the left he cuts back that way. 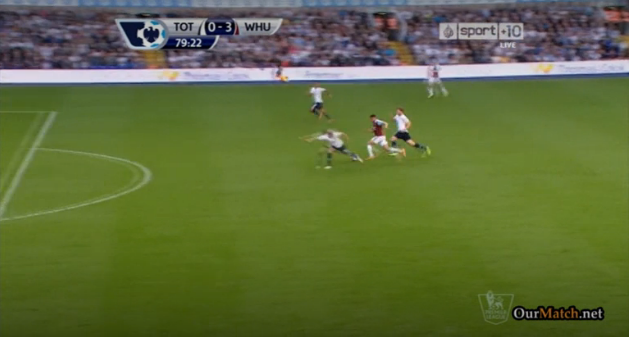 If you watch Vertonghens run (and face), you can see he clearly *assumes* that Dawson will win the ball. That's why the gap was there, and that's why it was too late once Morrison cut back that way. Vertonghen actually slows his run before this, assuming Dawson will win it. Overall, naive, sluggish, and apathetic performance. I still feel the movement in the final third is going to be crucial, and the main cause of our consternation yesterday. Defoe was desperate to score in front of Hodgson, clearly, but didn't do enough for the team because he just wanted to be on the end of things without being involved. I also think that its games like that where playing with inverted wingers can overcrowd the space, and think if we had had Lennon on the right (when fit) and Townsend/Lamela on the left, we would have created more space, and more opportunities. Excellent point re goal three - I can see what you mean when I watch it again. AVB's decision to take a near full strength squad to Anzhi baffled me at the time and I think was the primary reason for this lethargic display. AVB rotated the team yet crucially for me, still asked many of the first team to travel (Daws, Townsend, Soldado, Eriksen). It was a 3400M round trip. It may have "only" resulted in a 3 or 4 percent dip in performance levels but given our game is not fluid at the best of times, these percentages count. If AVB had of seen Anzhi's first game in the EL, he would have known they've conceded that competition long ago. They made several changes themselves so AVB didn't need the security of our big hitters on the bench. Anyways, I hope given the lengthy journeys for Tromso and Sheriff, AVB decides to take a shadow squad (consisting of the Carling Cup team and our impressive development team members as squad options). Having invested 110M in the summer, Levy will be looking for CL football. The priority has to be 4th in the league but I still think we can do both IF AVB is a bit more pragmatic with the away games in this group stage. Also the set piece issues are a huge disappointment. We bashed Harry for this, and under AVB it hasn't improved at all, despite us being the tallest side I can ever remember. Offensively we are poor, despite having set piece specialists like Sig and Eriksen in the side. As Big Sam realizes, these are easy goals to score and cheap goals to concede at the highest level. He's also got to stop playing Naughton at LB. The man is an RB. He's never, ever played well as a left back and given Sigurdsson likes to cut in, two full backs. AVB was brought in to give youngsters a chance yet Fryers gets overlooked for a senior player who has never looked comfortable on the left, Caulker gets sold the moment it gets a bit too difficult to coach him and Carroll is off learning under a manager we all damned doesn't teach players anything. Selling Caulker annoyed me the most. Sure he had issues but Ledley King was not a great defender at 21 either. Totally agree about the Europa League, madness taking all those players. Even more baffling when you consider Defoe played that EL game & Soldado travelled only not to be rested for West Ham. A great manager, like Fergie was, managed his squad by seeing scenarios 3/4 games in advance. You need that when tackling European and domestic football. Ours is still young but in this case failed to see beyond the game being played. I had no problem with Defoe playing vs West Ham. He has a great record vs them and his majestic goal broke the deadlock in the last home vs West Ham. Yet Soldado should then have played vs Anzhi. Having been left out of the Spainish squad, he needs games and goals and Anzhi were a great opportunity for him to fill his boots, thus leaving Defoe fresher for West Ham. Instead Defoe was left playing two games in 3 days including a lengthy trip inbetween and was unable to display his full potential before joining up with England and Soldado will now not play a full game for 3 weeks and he's shot of confidence. Caulker really wanted to leave though. It's a shame for us, but as 4th-choice centre-half he wasn't going to get the game time he wanted. I actually think we did the right thing getting it over quickly rather than having a disaffected player stagnating. Loads of good points there! I have to agree re: Anzhi, resting a few more key players might have been wise in hindsight. That said, I (unlike some) am pleased to see us take the Europa League pretty seriously. Set pieces really *are* dreadful, at both ends. The first goal was so, so scrappy. Maybe Vertonghen was pushed, but 1. he must be stronger, and 2. Dembele simply can't let Nolan run free like that. Had a conversation before the match agreeing that Holtby should play not Ericksen because of the likely physical nature of the game. At half time AVB could have improved things by bringing Holtby on but he never does things like that. That said if JD had taken his chance just after the break it would have been very different. I've never seen a game where we looked so comfortable only to lose 3-0 to a poor team. As with most Allardyce teams the first goal was only ever going to come from a set play. What followed was a result of their tails being up and our chasing the game with the wrong players. As well as Dembele has been playing I think we need to be playing with Paulinho and Sandro. And as for the full back situation Naughton should never ever be played in the league where it matters. Whether on the left or right he is quite simply not good enough and weakens the whole team defensively and in attack. Yesterday Jan should have been at LB and Chiriches in the centre. BAE being loaned out to QPR is unforgivable insanity. My biggest worry long term is that AVB doesn't seem to learn. Two of the reasons we missed out on 4th last season was his use of important players in a fruitless pursuit of the Europa League (AKA the competition designed to prevent upstart clubs from having the energy to compete for CL places) and the use of Naughton. And what are we seeing now.... Oh and his rigidity during matches, learn from Mourinho that sometimes you need to change the pattern within a game, it's not an admission of failure that the original team selection was wrong, it's a display of tactical nous and strength to change things during a match. God I'm in a foul mood today!!! Jill I completely agree on Holtby. I think he should have started, be it at the expense of one of the midfield two, Eriksen, or Sigurdsson. He seemed a perfect fit for this one. Totally agree with your thoughts on the full back situation too, as well as AVB's rigidity - that's my main gripe with an otherwise excellent coach. He must make changes sooner and influence the game when things aren't going well. Very good comments by Jill. AVB seems to be very rigid, which may be due to his youth. I think he needs to forget about what he did at Porto. It's on his CV already, but history is something that happened yesterday. We were running into their defence like tuna into a net. The players are becoming inflexible. As for Defoe, he doesn't fit the system and he should be third choice behind Soldado and Adebayor. As regards Dawson, he didn't need to make a tackle, just shepherd RM away from the goal onto RM's left. Good defending, to my mind, doesn't mean always tackling. By the way, West Ham will do this to a number of teams, but the likes of Arsenal have a much more fluid pattern of play. As regards the EL, drop it. : it's a poisoned chalice. Yes, we are Spurs and go for glory, but that motto is starting to be a millstone. I agree with dropping the EL. If we want to win a competition, go for the Carling Cup. Less games, less travel, done by Feb and the result is the same. A mickey mouse trophy in the bag. The EL will be won this year by a team that is not taking part in it right now. That sums it up for me. It's an awful competition that Andre himself only won because his Porto side dropped into it having failed in the CL. I want to win the cups but not this one. I have no respect for a competition that allows teams to join it midway. 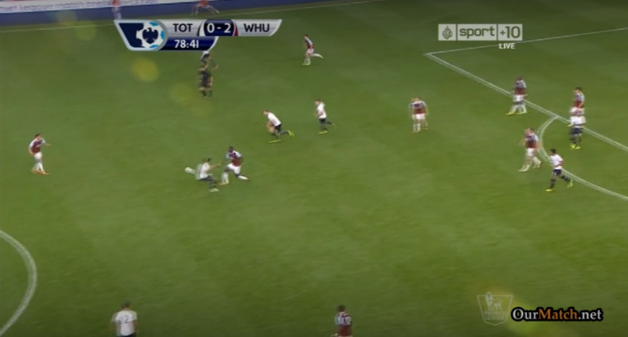 In relation to goal one, I think you will find that Reid does not jump with Vertonghen because Reid is in the process of pushing Vertonghen forward as he jumps; you will see that Vertonghen's finishing position is a long way forward. Goal two is very fortuitous and as much a result of Walker being way up field in search of the equaliser. That does not excuse all the confusion in the centre of defence, which ought by now to be alive to these forays by wing backs. But by now the game is beyond us and we disintegrate. After that there's a kind of blind seeking after an unlikely way back and there is disarray everywhere. Unlike last season where we got stronger as games went on, we are running out of steam in matches and a trip to Moscow would not improve this tendency. We will now see the extent to which AVB can restore confidence and regain momentum against the background of the international break. I do wonder about our goal-scoring ..... out chance/goal ratio is low and I note that other sides make more of the more limited chances they get ........ something for the training ground, perhaps? Have to say I thought the first goal would be disallowed for a push as did a lot of people around me. Agree on point 1 - he does get a shove. Should he be stronger? Possibly. Could the referee have given a free kick? Possibly. Great points. Spurs tradition has always been entertaining football. You are never going to get this when you play two of Dembele, Sandro, Paulinho, Capoue in midfield. What Spurs need is a creative playmaker in midfield. A player like Isco, Pirlo, who can link with the front players. I think Holtby or Ericksen depending on the game could be the creative player we need in a midfield three with Sandro and Paulinho. Believe Hull have this very good creative midfielder, think his name is Huddlestone??!! Lets face it tho' we've not recovered from losing Modric and VDV, I understand why Modric had to be let got but the subsequent sale of VDV was suicidal. VDV wanted to leave and AVB did not want to sell. As you will note, both sides suffered as AVB is now no longer with Sylvie. Are you seriously trying to tell me that the "red scum" played boring football with Vieira and Petit in MF? Or, that Brazil play boring football with their current double-pivot? Lets not forget we also lost Rose in a HOME game against a pub team in the euro league. Plenty of work this week Windy. Clear push on Verts for the first. I've got the video on my blog. Clearer than photo shoot. AVB has a large squad of decent players albeit with certain black spots, left back mainly Who would have thought that we would miss Rose.. Needs to see the big picture in terms of teams for different competitions and to prioritise the Premiership ruthlessly. Or that nice Mr. Levy will have his balls in a vice. Complete nonsense this week. If Soldado had played in the minor comps he might have a similar goal tally to Defoe. Not quite as Doomsday as I was on Sunday night. Build up is painfully slow and too predictable. Could go 3 at the back against bus parkers and have an extra man in midfield. Should have done this when Walker was clearly unwell/unfit. Cheers Jimmy. Yeah I think in hindsight the push on Jan was telling. Clear foul? Maybe. Defending aside from that was still woeful - Nolan running off Dembele, etc. Agree about Soldado - he managed two in his Europa League appearance!